The controversy surrounding Sunbury’s troubled security camera system continues to rumble on this week. There are still far more questions than answers. Big Brother – but is he even Looking? At last week’s meeting of the City Council (January 13th 2014), Mayor Persing, closely questioned by audience member Mr. Drake Saxton, gave a master class in the art of obfuscation. Representing Not The Item, Mr. Saxton attempted repeatedly to disentangle fact from fiction, in a situation which is rapidly descending into the realms of farce. Photographs taken on the morning of Wednesday 20th November by a concerned citizen show a serious and potentially life-threatening situation involving the City Department of Public Works – director Councilman Kevin Troup. 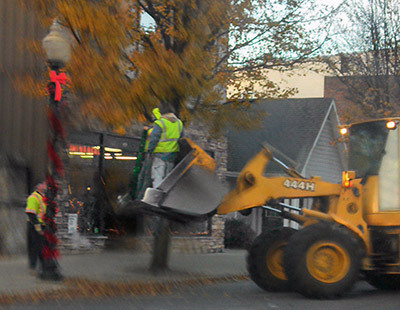 Workers can be clearly seen, in flagrant violation of OSHA safety regulations, standing in a front loader bucket hanging garlands from lampposts. Why is this so dangerous? If the machine’s engine stalled, or simply ran out of fuel, the hydraulic pressure would fail instantly, and the heavy bucket would fall like a stone, throwing anyone within out onto the road. It could also do some serious damage to any vehicles parked underneath where they were working.